The composition centers on two couples. 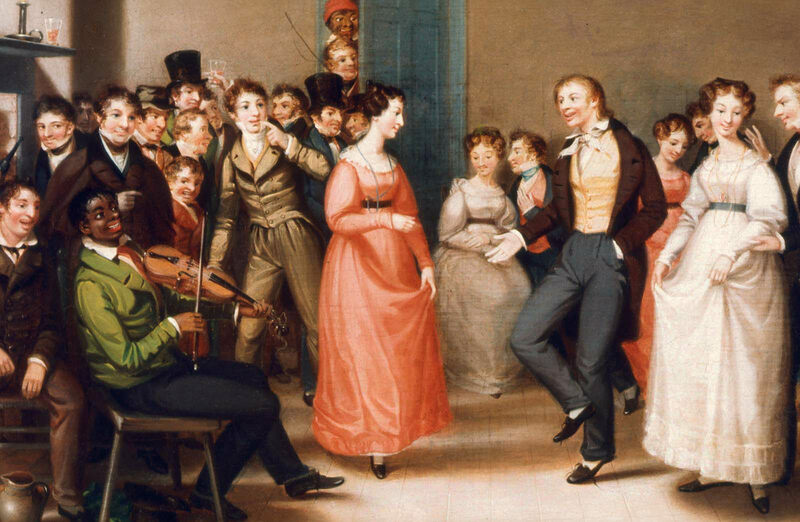 The fashionably dressed woman in red appears indifferent to her dance partner, a “country bumpkin” whose untied laces, loose cravat, and awkward countenance present a striking contrast to the other principal man. That dapper swain, with his trim black suit and starched collar, has made more progress in his pursuits. He caresses the sleeve and neck of a pretty woman whose white dress signifies her youth and innocence. Along the back wall of the room, two of the other five women are showered with male attention; in the right foreground, another waves flirtatiously at a youth in a light brown suit across the dance floor. While his intrigued look may be directed back at her, the heart pendant on his cravat links him romantically to the girl in white, whose own heart charm dangles from a golden chain around her neck. Is he about to lose her to the handsome rival? The men in the crowd behind him ogle, snicker, and stare across the room, their behavior explained by the shortage of female prospects and by the circulating libations. Only the man in the heavy brown coat and gloves appears attentive and observant; his resemblance to the portrait on the wall suggests that this is his parlor and he is the host of the lively event. The young black coachman in Rustic Dance may also refer to the party’s preceding sleigh ride; he peers into the room through the open doorway, still wearing his red hat and toting a horsewhip. Another black man fiddles a tune for the dancers, and a third, with bellows in hand, tends a glowing fire, not seen but implied by the warm light emanating from behind him. Marginalized black figures recur in Mount’s genre pictures and were drawn from contemporary stereotypes of African Americans as comical, childlike, and content with their deprived social status. Mount visually connects the three black men through their respective instruments: the fiddler’s bow, the coachman’s whip and the nozzle of the bellows lead the eye from one to the next in a triangular motion that underlies their separate, servile status. Only the hands of the longcase clock point as decisively, indicating the midnight hour. Shown to great acclaim at the National Academy exhibition in 1830, Rustic Dance depicted, according to one critic, “the dance taken from the popular story of the ‘Sleigh Ride.’”  While the specific source of this story is unknown, the critic’s comment connects Mount’s work to contemporary trends in American literature and theater. Mount, a largely self-taught painter who chose to live in rural Stony Brook, Long Island, traveled to New York City regularly and was aware of character types that were gaining popular favor in the era of President Jackson, whose political stance celebrated the common man. 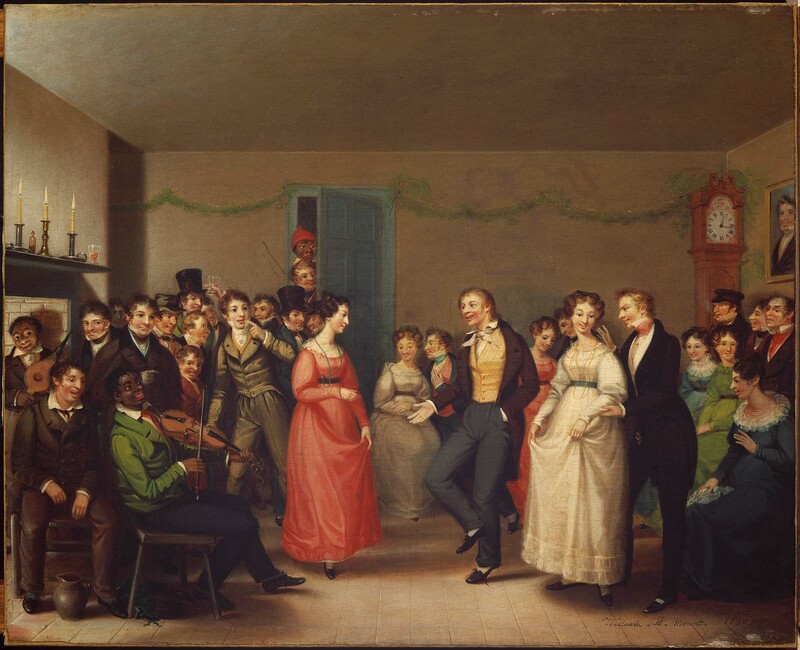 The polished swain, the country bumpkin, and the comical African American appear in Mount’s subsequent paintings, as do themes of drunkenness, rustic music and dance, and the whimsical love triangle. 1. Mount quoted in Alfred Frankenstein, William Sidney Mount (New York: Harry N. Abrams, 1975), 18. 2. National Academy of Design, undated clipping, Setauket Scrapbook, p. 5, quoted in Deborah J. Johnson, William Sidney Mount: Painter of American Life (New York: American Federation of Arts, 1998), 24. Lower right: William. S. Mount. 1830.